Click for Voluntary Application Form. sport activity, science-art workshop etc) In case every two months, an activity will be organized with the participation of all children and volunteers in the Project. By contributing education and development of attendant volunteers in this project, to facilitate their work with refugee children which is vulnerable groups, on 23-24 February “Understanding the Refugee Children Voluntary Training” will be organized and during the Project sharing and supervision meetings will be held with project advisor every other week. As a “Fraternity Volunteer”, you can share your time, knowledge and smile with children, you can establish in their life a bond that will never rupture. Who can apply for Fraternity Volunteer? The volunteers who will be in charge at Fraternity Bond Project will be determined by interview after their application. 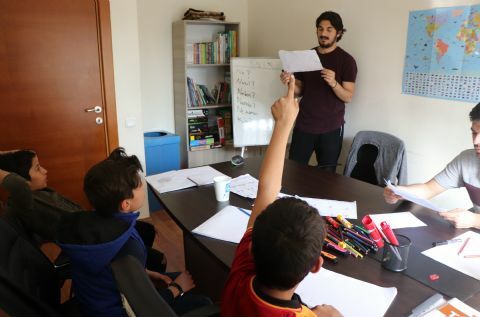 Voluntary applicants must attend Understanding the Refugee Children Voluntary Training that will be organized in Istanbul Medeniyet University Göztepe Campus Aşık Paşa Conference Hall between 23:00 and 18:30 on 23-24 February 2019.